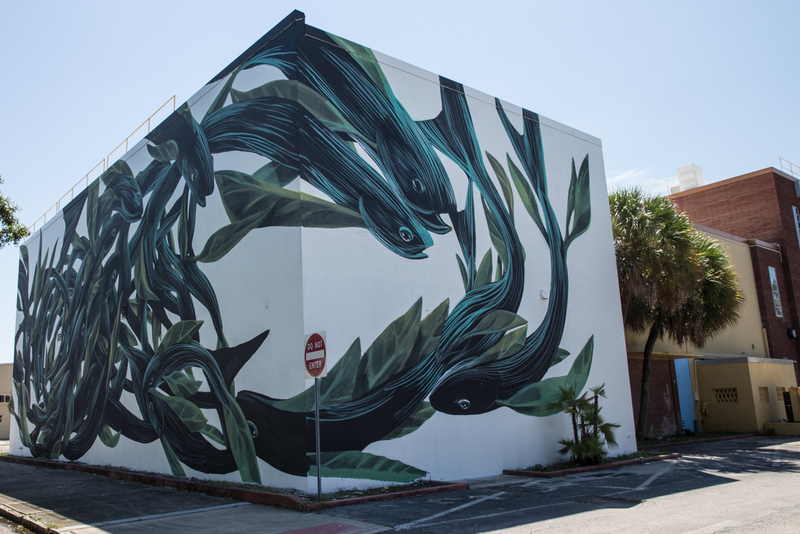 Pantónio grew up in the Azores islands off the coast of Portugal, and has painted his flowing murals all around the world. “I am proud to paint Le Pont Des Arts in Paris, a symbol of romanticism… My creative process was not easy, but truthful, personal, and focused on more than the visual impact, I focus on the meaning, to honor the place.” Pantónio said of painting his abstraction of a break-up on the famous lock bridge in Paris. The locks were taken down after the wall broke from the weight, but previously this was where couples pledged their love by placing a lock on the bridge and throwing the key in the river. His selection of colors seem to bring out the linear dimensions of the animals, and his brush strokes flow like little rivers of cool colors. You can see the influence of his hometown culture in the subjects of his paintings, like mermaids, boats, fishes, and ropes. It is a pleasantly mesmerizing experience to view one of his creations up close. So delightful!